Out of sight, out of mind applies to many residential septic systems. But just because you don’t see your residential septic system every day doesn’t mean it’s self-sufficient. Instead, it’s likely in need of a septic tank cleanout and inspection. Jones Plumbing & Septic Tank Service provides all of the septic tank services required to effectively maintain and repair any residential system. Call us today to schedule an appointment for residential septic pumping! Knowing and recording the location of the septic tank and drain field. Not all septic tank companies are the same, but Jones Plumbing & Septic Tank Service stands out from other companies. We’re always happy to explain how septic issues occur and what steps you can take to avoid them. For comprehensive septic service, call us today! A residential septic tank should be pumped out every two to three years, depending on the household size, among other factors. Without regular septic tank service, homeowners suddenly find they have a huge mess to clean up and expensive repair bills to pay to fix these issues. Homeowners want healthy lawns, but if your lawn has lush grass in only one or two areas, these vibrant patches are likely located over the septic system. When the septic tank is full, the system still attempts to handle waste. But, because the tank is full, waste is forced to seep out into the surrounding soil. Patches of lush grass are the result. A slow drain is usually a sign of a localized clog in the plumbing. More than one slow drain in the home means your system needs professional septic tank services from Jones Plumbing & Septic Tank Service. Since the plumbing and septic systems connect, an increase of effluent inside the septic tank causes drainage speed to decrease. You likely know the dangers of solids building up inside the tank but what happens when there is too much water? An excess of water can carry solids into the outflow line, allowing solids to either clog the outflow or deeper regions in the drainfield. The bacteria and enzymes inside the septic tank may also be flushed out, which will cause solids to build up too quickly. 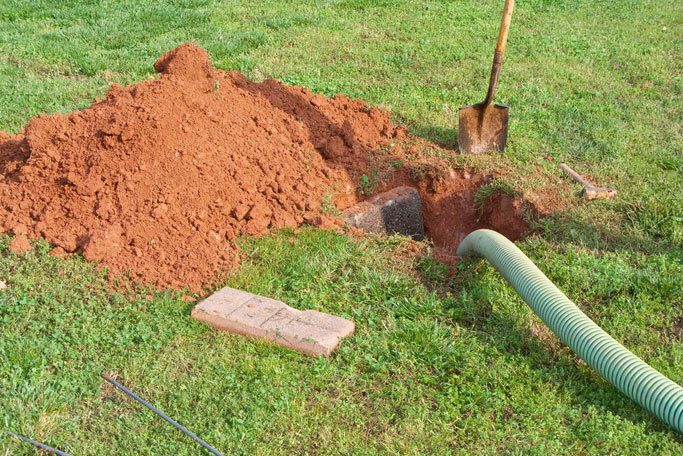 Since the septic tank is buried under the lawn outside, knowing when it’s time to call Jones Plumbing & Septic Tank Service for a septic tank cleaning can be tricky — unless you look for these three signs. Organic solids usually have an smell, but so does gray and black water that comes from bathing, washing dishes and laundry and flushing the toilet. These types of water combined make acrid odors. Conversely, if you hear a belching or gurgling noise coming from the drain, the septic tank is most likely full or nearly full. Other than a sewage backup, having pools of water in one part of the yard without rainfall is a tell-tale sign the septic tank needs a cleanout. Once the tank is full, solids begin to clog the drain field and force liquids to the surface. The ground quickly becomes saturated and the result is pools of wastewater and sewage. Sewage backup is almost always the No. 1 sign that lets residents know it’s time to schedule septic tank pumping. Backups generally occur in drains located in the lowest point of the home. If you notice or smell raw sewage, call Jones Plumbing & Septic Tank Service immediately.